54.99 GBP Only 2 left In stock, ready to dispatch. Equipped with an array of innovative call management features, such as the ability to block specific numbers and silence anonymous callers, the Panasonic KX-TGC 223EB comes with one base station with a built-in digital answering machine and three handsets. Easier on your environment as well as your wallet, the KX-TGC 220EB features an intelligent economy mode. When the handset is near the base station while in use, power consumption will be automatically reduced to extend the battery life. On a full charge, the battery provides up to ten hours of talk time. 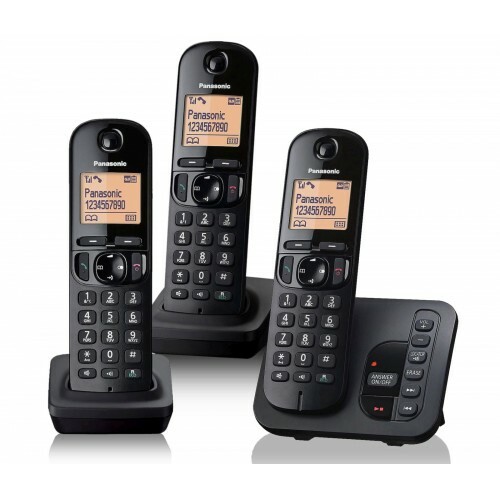 With three handsets, the Panasonic KX-TGC 223EB is ideal for larger homes and offices, particularly those that are plagued by unwanted phone calls.